Hope you're having a lovely weekend! Got off to a great start here as last Thursday we were lucky enough to have another theatre trip to London, this time to see "School of Rock". It was absolutely terrific......hadn't even seen the film before, but loved it and would definitely recommend! We actually decided to be very naughty and treat ourselves to a few shows over the next few weeks, taking advantage of a promotion that ran from the beginning of December, where tickets for many of the West end shows are heavily reduced, basically to put bums on seats at the quiet time of the year......so we will also be going to see The Lion King, this week (sooooo excited!!) and later in the month we are seeing Les Miserables, which I'm hoping to get through without bawling my eyes out this time! Megan came back from Uni, to go to the theatre with us and whilst she was home, also reminded me to make a Wedding card and candle for one of her Uni pals, so whilst I was I had a bit of crafting time I decided to crack on with a card using a super cute LOTV stamp that I got last year, but still hadn't got round to using (shame on me 😞) I believe it goes by the name of In the County, and is a little treat to colour. I have used my ProMarkers, as ever. I raided my paper scraps box for both the green gingham and also blue dotty papers. I also used Magnolia fence die, cloud die and sentiment die too. 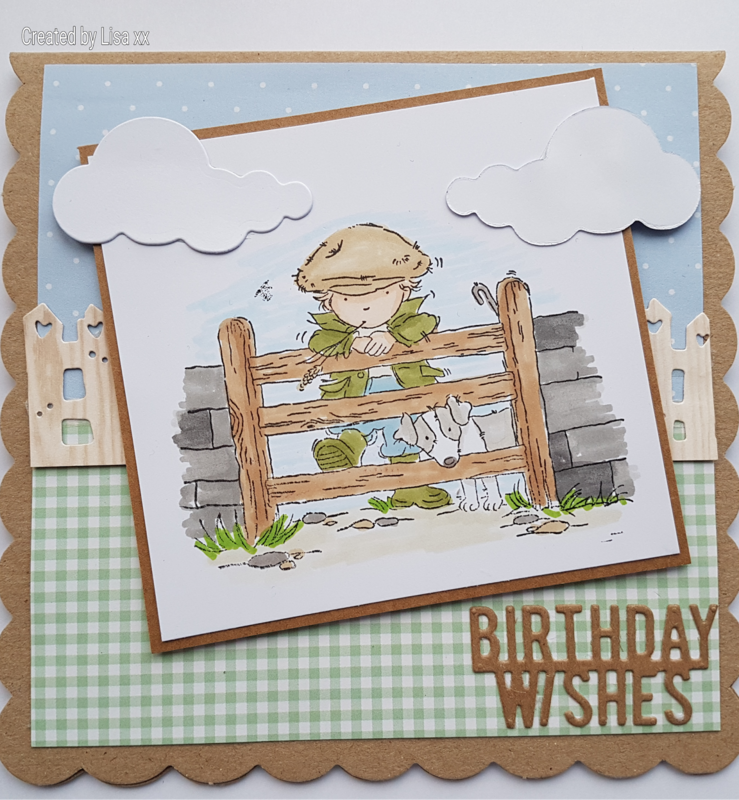 Gorgeous card Lisa, love the image and papers you have chosen and the cloud die cuts finish it off perfectly. It sounds like you have a fun few weeks coming up...enjoy ! Wonderful card for a guy! Fabulous colouring too. 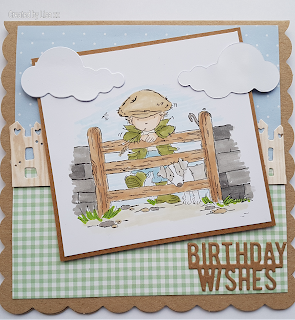 The papers are perfect for the country look as is the fence die cut. Perfectly finished off with the clouds and sentiment die cuts. oh I love this card - when we have been crafting ''too'' long and can instantly recognise all the components it's like wining the lottery, because you then know you to have the potential to put together a similar card...... well the inspiration is there, it's just down to the 'will' And this card has left me with, yes I will!! Such a fabby card Lisa.